An exploration of the space between all that matters. Nothing exists is a philosophical quandary, a statement comprised of absolute polarities, in which it’s meaning is inherently dependent on one’s perception. This composition presents us with the opportunity to think critically. Whether abstract or rational this contradiction confronts us with a perplexing challenge, testing both our beliefs and knowledge. Somewhere between something and nothing exists a space of uncertainty. This moment is immeasurable, yet more substantial than that which is tangible. Nothing exists, it is waiting to be defined. Questioning this requires faith and fact. The more we understand that nothing is something, we realize nothing exists. See blind. Hear silence. Feel the truth. 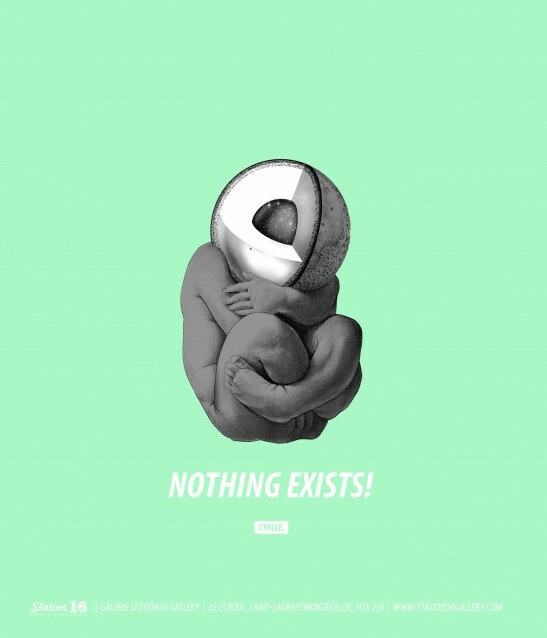 La galerie Station 16 est fière de présentée “Nothing Exists,” une exposition solo du collectif de Los Angeles Cyrcle. Explorant les thèmes de la religion, la science et la dualité, cette exposition marque le retour de Cyrcle à Montréal après leur participation à l’édition 2014 du festival MURAL. June 4th, 2015 at 6pm. The exhibition will run through July 4th, 2015.